The mission of Heatonist is to bring together the best examples from today's hot sauce makers, creating a curated selection that truly represents what can be accomplished across the spectrum of heats and flavors. The Heatonist experience in New York City is about discovering new hot sauces in an innovative retail tasting experience, with a focus on quality ingredients and quality processes. Their emphasis on quality and design shines through in their sticker and label art as well. The main storefront in Williamsburg Brooklyn and an outpost at Chelsea Market in Lower Manhattan help create awareness and drive business to their brand in real life. But it's in the digital world where this team really covers all of the bases. Sure, they've got the requisite social media sites, but they have become a media empire with the Hot Ones Show hosted by Sean Evans and presented by First We Feast and Complex Media. They have A-list celebrities from all walks of culture, from sports to movies and from cooking to television. The Hot Ones Show is a progressive eating challenge that ramps up the Scoville Scale with each bottle, and the host and the guest try to stay in the game by surviving the heat. First We Feast is an online magazine focused on food, drink, and pop culture, and Complex Media is a New York-based media platform that reports on trends in style, pop culture, music, sports and sneakers with a focus on streetwear, sneaker culture, hip hop, and graphic art. In the photo above, we have a variety of stickers and labels that Heatonist ordered for their marketing and labeling purposes. The custom bottle label on their Classic Hot Sauce feature a matte label. The Sean Evans custom shaped sticker—also in a matte finish—helps promote the Hot Ones show. 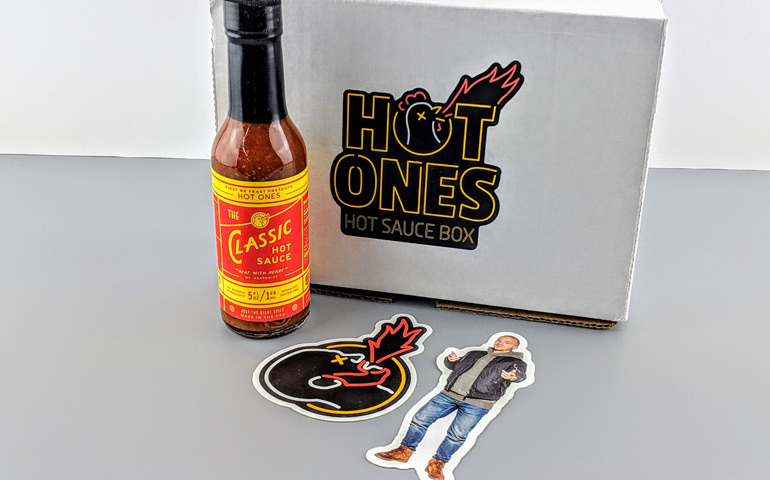 The die cut sticker on the monthly hot sauce subscription box is a nice branding touch, and if you're in need of monthly sauces, they offer it for sale on their website. As you can see, they've created an experience around their brand that covers all of the bases, from retail to social to monthly subscriptions. You can find all of the Hot Ones episodes shows on their YouTube channel @FirstWeFeast, and you can join their five-and-a-half million (and growing) audience for all the new episodes. Or check out the @Heatonist on their Instagram and Facebook pages to follow along with all of their compelling content. 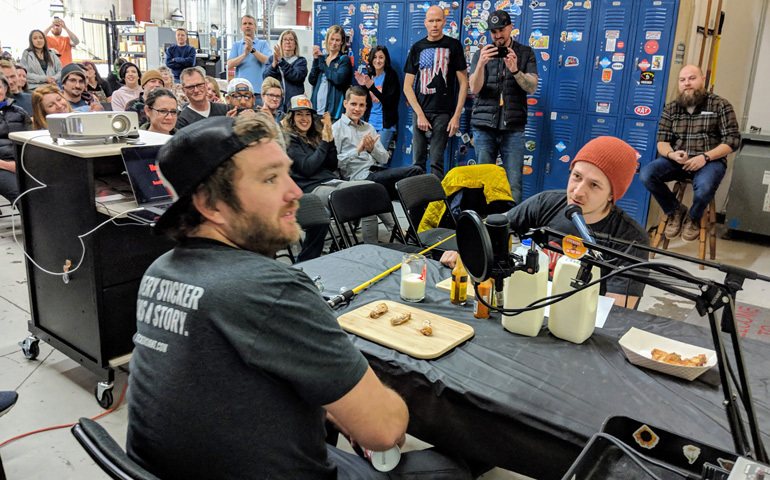 In honor of Season 8 of the Hot Ones Show, two members of Team StickerGiant treated our entire company to a live throw-down during our company meeting. They used Hot Ones sauces adorned with custom bottle labels from StickerGiant, and it was quite the display. Here at StickerGiant, even the meetings are fun! But as an example, this demonstration was a testament to the power of a great concept. In this case, it's a hot sauce brand that helped create a phenomenon on the internet with a top-notch show that brings in great guests, with a twist. Just in this case, it's a really, really hot twist.